A world is taking shape in the palm of your hands. Take on the role of super beings and compete to create perfect worlds with the ideal conditions for wildlife to flourish. 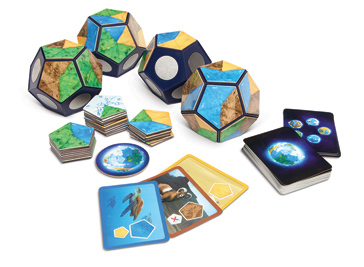 In this very unique game, each player’s board is a 12-sided 3-dimensional planet core. 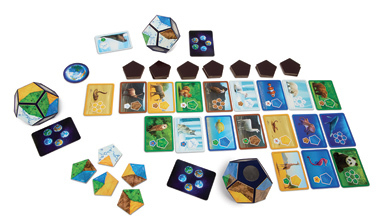 Throughout 12 turns, select landscape tiles representing oceans, deserts, mountains or frozen lands, and arrange them on your planet to create the best ecosystems. 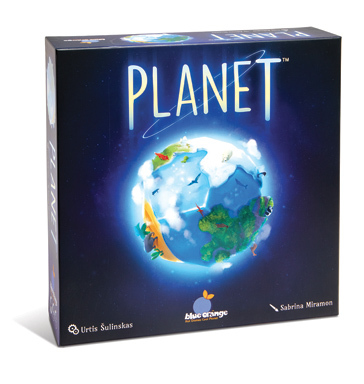 Win Animal Cards while fulfilling your own ‘’Natural Habitat’’ objective and create the most populated planet in the universe!